The Metropolitan Washington Road & Transportation Builders Association (MWRTBA) discussed rail infrastructure during an Aug. 11 meeting at the ARTBA building in Washington, D.C. 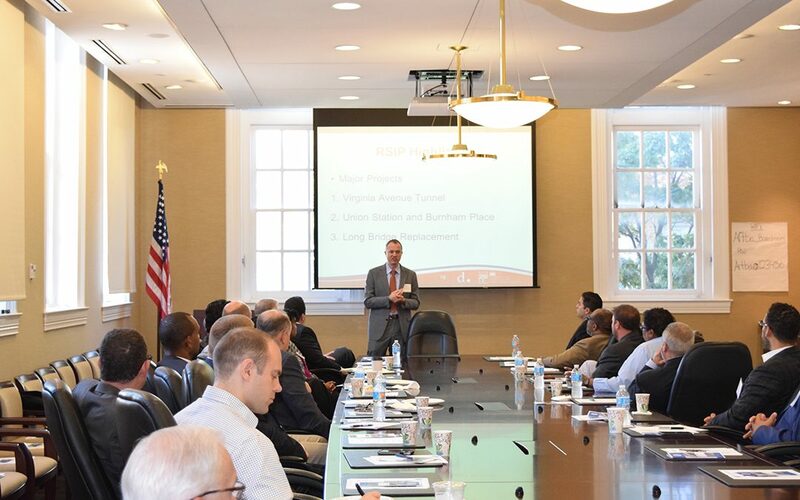 The group’s breakfast briefings provide networking and learning opportunities for transportation construction professionals in the District of Columbia and the Metropolitan Washington area. Ryan Westrom, senior transportation planner/engineer within the Policy Planning and Sustainability Administration at District Department of Transportation (DDOT), briefed attendees on a rail plan that focuses on both passenger and freight infrastructure. Details can be found on the agency’s website. DDOT Director Leif Dormsjo also introduced participants to Moises Marrero, the new acting division administrator for the D.C. office of the Federal Highway Administration, and Tanya Emam, new assistant division administrator for the same office. MWRTBA’s members include contractors, subcontractors, materials suppliers, engineering firms, law firms, accounting firms, bonding and insurance firms, the construction equipment industry, and the traffic safety products industry. Contact MWRTBA Executive Director Mike Sakata or visit www.mwrtba.org to find out more. The next MWRTBA breakfast briefing will take place in October and include an update on the South Capitol Street project. The date hasn’t been set, so please check the website.